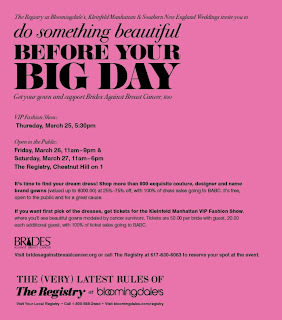 Brides Against Breast Cancer - March 25, 2010 Chestnut Hill Mall 5:30 p.m.
We hope that you will pass along the information about this event to your friends who may still be in search of the perfect dress. Please join Southern New England Weddings along with Bloomingdales and Kleinfeld Manhattan to bring you hundreds of designer and couture wedding gowns at huge discounts, with 100% of the proceeds benefiting Brides Against Breast Cancer. Dana Markos Events will provide all floral design and bouquets. Tickets are still available and we hope to see you there! Visit www.bridesagainstbreastcancer.com for your tickets today! The perfect image of a Flower Girl! On a rainy day....A breath of spring!!! !